This product from Chess Baron: Free Shipping for UK. The superb DGT Easy in 'Black Beyond' colouring combines high quality with simplicity. Easy clocks are practically unbreakable and very suitable for children, schools, chess clubs and home use. 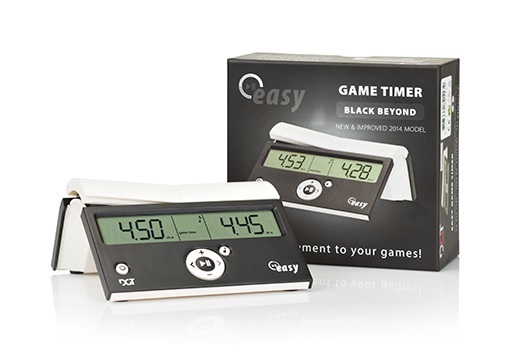 The 2014 updated versions of all Easy clocks were released with larger display, larger buttons, improved lever, additional "move timer plus save" option and... yes, Batteries Included! High quality digital chess clock - Beyond Black. Batteries Included!